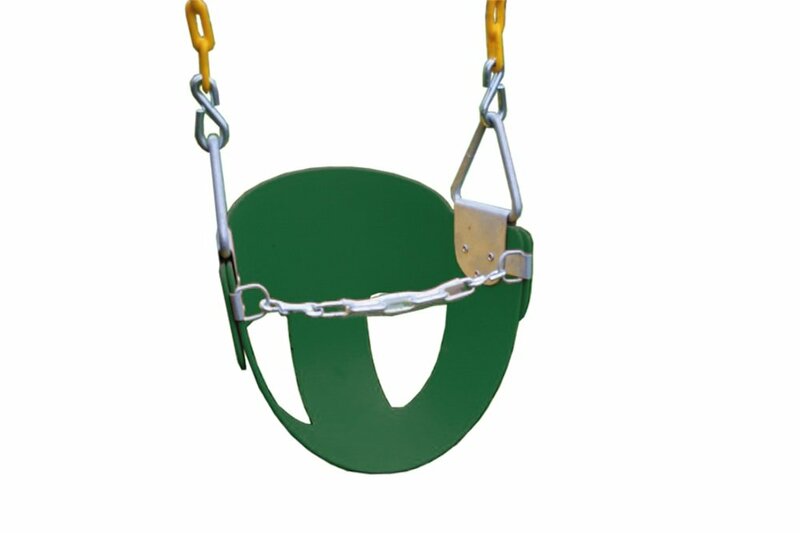 Let your children feel the wind rush through their hair with the EasternJungle Gym Green High Back Half Bucket Toddler Swing with Coated Chain. With ahigh back and half bucket body, this swing has an all-weather, rust-proofdesign. Additionally, this swing features plastisol-coated straight coil swingchains that are stronger than rope and designed for soft grip and pinch-freeplay time. The durable copolymer plastic seat is equipped with a front safetychain for added security to infants during play. Additional limited-timesavings reflected in current price. Copolymer plastic seat in green color.0.19 in. zinc coated chain. Heavy duty high back seat with safety chain.Recommended for 3 years and above. Dimensions: 9-13W x 12D x 10H in.. From the Manufacturer High Back Half Bucket Swing for your toddler features a unique high backrestfor added back support, Front Saftey Chain for added security while your childis swinging, and a heavy duty, all-weather, rust-proof design. Swing comescompletely assembled and attaches to most swing beams up to 8' 6" high.Features Plastisol coated straight coil swing chains that are stronger thanrope, designed for soft gripping, and "pinch-free."